The RHS series are designed for testing the concentration of salt water and brine. Provides a direct reading of the specific gravity and concentration (Parts Per Thousand) of salt in water. It provides reliable refractive index and salinity readings of total dissolved solids of aqueous solutions. It is used for quality control in research and clinical laboratories. it can be used to check and maintain stock solutions and dilutions. In the food industry, it is especially effective in the preparation of frozen vegetables, fruits, seafood and ocean byproducts. 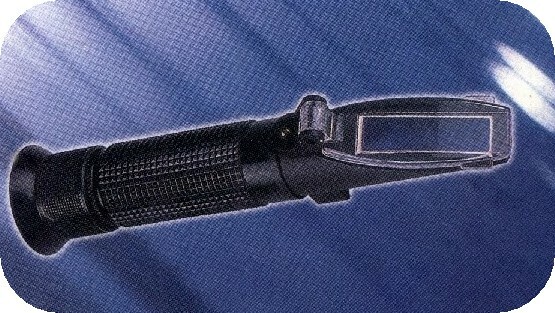 The salinity Refractometer is also used in oceanography and seawater studies for determining soil quality. The model having ATC (Automated Temperature compensation) is ideal for filed use. The scale range of 1.000 - 1..070 Specific Gravity (SG) are provided. The RHS-10ATC has a built-in automatic temperature compensation system for field use. This model has a larger measuring range , it can be used for measuring salt in brine or used for controlling the saltwater concentration when preparing pickles or any other prepared food solution. The RHS-28ATC has a built-in automatic temperature compensation system.